Click the Start button, and then choose Control Panel from the menu. In the Control Panel window, click the Power Options icon. The Power Options Properties dialog box appears. Click the Advanced tab in the Power Options Properties dialog box. You can control three items: the laptop’s lid-closing action, the power button, and the sleep button. For each of the power buttons (and lid), choose an appropriate action. Do nothing: Nothing happens. This option is preset on every Congressman’s laptop. 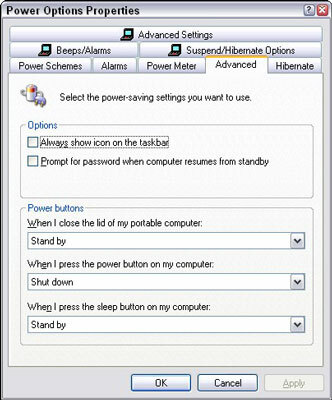 Ask me what to do: Although this option isn’t available to those snooty Windows Vista users, choosing it directs Windows to display the Turn Off Computer message (refer to the below figure). You can choose what to do from that menu. Note that this option is obviously not available for when you close the laptop’s lid. Stand by: The computer goes into Stand By mode. 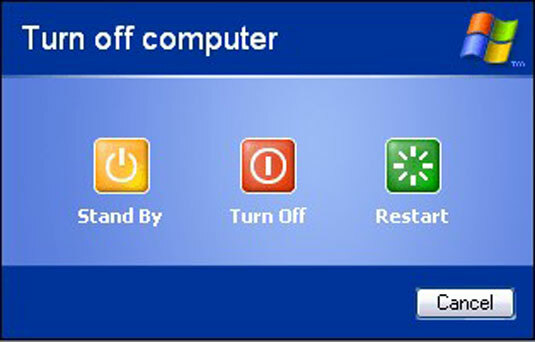 Shut down: The computer shuts down Windows and then turns itself off. Note that not all the options listed in this section may be available. It all depends on your laptop’s design and whether the manufacturer has enabled certain functions. In other words, don’t get all bent out of shape just because an option isn’t on your laptop!